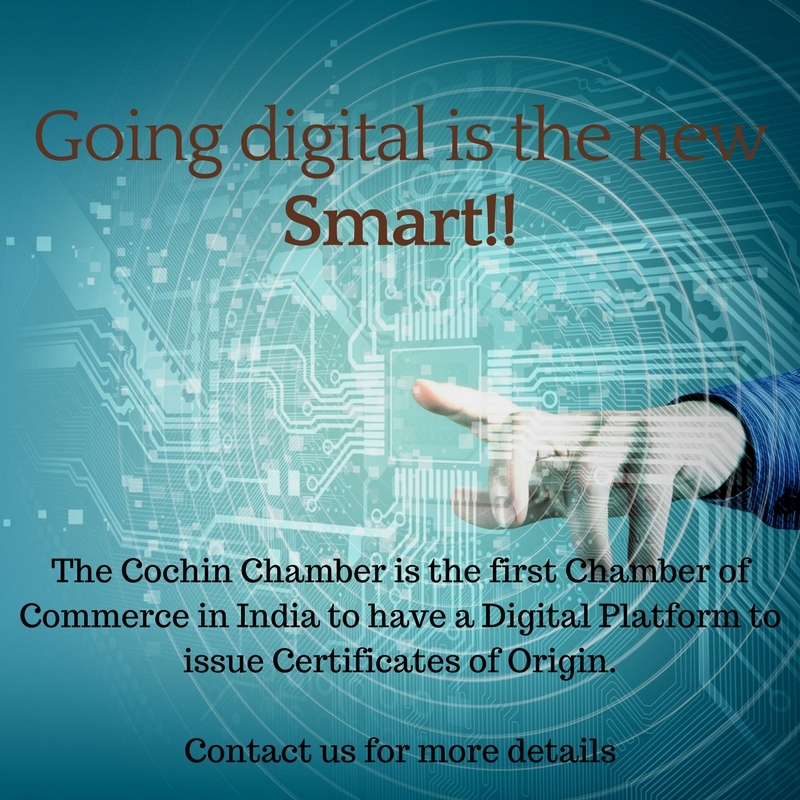 The Cochin Chamber has been an advocate for industry & commerce in Kerala ever since its inception back in 1857 and in this context, we had taken the initiative to explore the possibility of arriving at a solution to the recent labour issues at Synthite Industries one of our prominent members. We were deeply disturbed by the turn of events at Synthite Industries as such issues would affect not only the said Company but others too in the long run. New investment possibilities into Kerala would also be affected by such unwarranted problems. We in the Chamber did whatever possible for the resolution of the issue and we are happy now that the problems have been resolved and normalcy has been restored. We trust that such incidents will not occur in the future. The Cochin Chamber applauds the State Government and everyone else who were responsible in ensuring the settlement of the issue. You will be aware that Labour Ministry of the Government of India has put out a draft of the various changes that they propose to bring in the existing Labour Laws in the country. The reforms that are being contemplated are wide ranging and will impact industry in a big way. With this in mind, the Chamber organized a Workshop on Draft Labour Code on Occupational Safety, Health and Working Conditions on the 20th of June 2018. Realising the need to create awareness of the impending changes we brought in two subject experts, Mr. Neeraj Dubey – Joint Partner, and Ms. Akshita Alok – Senior Associate Corporate Advisory from Lakshmikumaran & Sridharan Associates, one of the leading Law Firms in the country. The Session was attended by delegates from different industry sectors. The session was a highly interactive one with the participants expressing their concerns and getting the clarifications that they required on the Draft Labour Code. The monthly CEO Forum Breakfast Meetings of the Cochin Chamber is nearing the end of its 3rd edition. The CEO Forum as you will know is a platform for networking and knowledge sharing and/or listening to talks on industry related and other matters. The July meeting, scheduled for the 6th instant will have Ms. Sudakshna Thampi, Yoga & Meditation Consultant and Founder – Instant Yogi as the Speaker. Ms. Thampi will speak on “The Art and Science of Yoga in Modern Day Life.” As always, the breakfast meeting will start at 08.00hrs with the session and ends with a Networking Breakfast by 10.00hrs. I am sure that you will have received the communication in this regard. The details regarding the programme are also given elsewhere in this Newsletter. I trust that more of our members will make it convenient to attend this programme. We are in the process of planning more programmes during the months of July and August, and are in discussions with Speakers for the same. The details of the proposed programmes will be sent to you in due course. The Cochin Chamber of Commerce and Industry organised a one-day Workshop on the Draft Labour Code on Occupational Safety, Health and Working Conditions, 2018 on Wednesday, 20th June, 2018 for its members and industry at large. The Workshop was led by Mr. Neeraj Dubey – Joint Partner, Corporate Advisory, Lakshmikumaran and Sridharan Attorneys, Bangalore and Ms. Akshita Alok – Senior Associate, Corporate Advisory, Lakshmikumaran and Sridharan Attorneys, Bangalore. The Draft Labour Code was released in March 2018 by the Ministry of Labour and Employment as per the recommendation of the National Commission on Labour to simplify and amalgamate the Central Labour Laws. The various existing Acts are proposed to be subsumed in four labour codes — on Wages, Industrial Relations, Social Security and Occupational Safety and Health and Working Conditions. The Labour Ministry had prepared a preliminary draft on Code on Occupational Safety, Health and Working Conditions, 2018 by amalgamating 13 labour laws relating to safety, and health standards, health and working conditions, welfare provisions for the employees and leave and hours of work. It was a highly interactive session wherein participants were able to get clarifications on various issues concerning their respective organisations. Mr. V. Venugopal, Vice President of the Chamber also spoke on the occassion. The Chamber will be organising Workshops on the other Labour Codes on Wages, Social Security and Industrial Relations in the near future. CEO Forum - 9th Breakfast Meeting - "The Art and Science of Yoga in Modern Day LIfe"
The Ninth Breakfast Meeting of the CEO FORUM 2017-18 will be held on Friday, the 6th of July 2018 at the Taj Gateway, Ernakulam. Ms. Sudakshna Thampi, Yoga & Meditation Consultant and Founder – Instant Yogi. 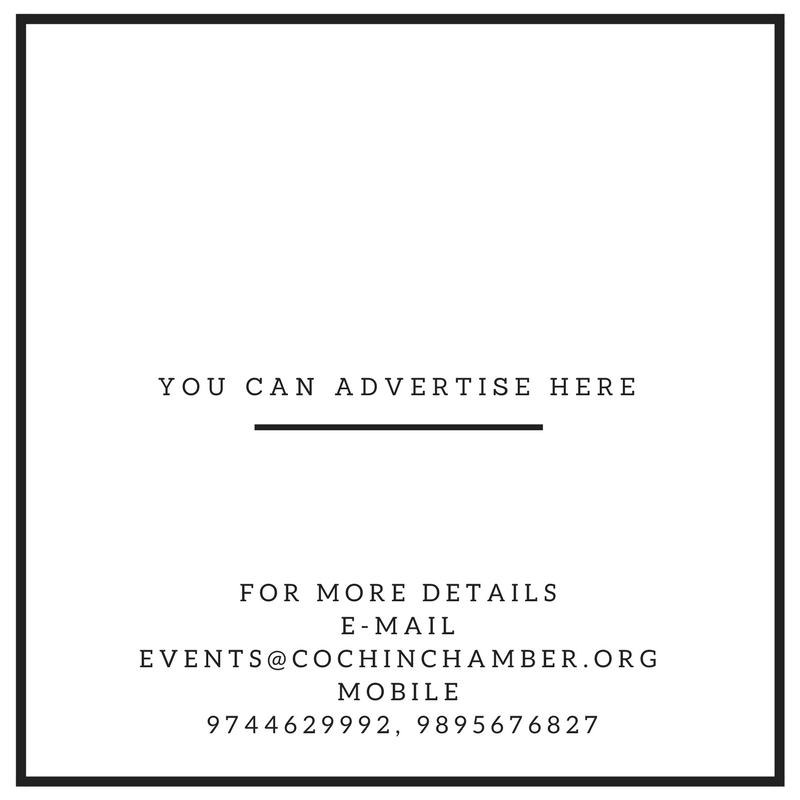 The Eighth Breakfast Meeting of the Cochin Chamber’s CEO FORUM 2017-18 was held on Friday, the 1st of June 2018 at the Taj Gateway, Ernakulam. Mr. Shaji Varghese, President of the Chamber, delivered the Welcome Address. Mr. Aditya Narwekar, Partner, PwC India’s M&A Tax & Regulatory Practice and Mr. Himanshu Aggarwal, Manager – M&A Tax, PwC spoke on the Mergers & Acquisitions – Impact of US Tax Reforms on Indian Companies and other M&A Tax Issues. The Speakers explained how the various tax reforms might end up affecting the Investments from the US and thereby leave a mark on the Industry here in India. Mr. C.S. Kartha, Past President of the Chamber presented Mementoes to the Speakers. Mr. S.P. Kamath, Executive Committee Member of the Chamber delivered the Vote of Thanks. All taxpayers (excluding exceptions like composition dealers) to file one monthly return with due dates being staggered based on the taxpayer’s turnover. On the matching principle of GST, the suppliers to continue uploading the invoices in the system. For all B2B supplies, HSN at four digit level will need to be used. The invoices can be uploaded any time. The system will automatically calculate tax liability, based on the details of invoices uploaded. The input tax credit (ITC) will also be calculated automatically by the system based on invoices uploaded by suppliers and the buyer will not be required to upload any invoices for claiming credits. There will not be any automatic reversal of ITC in the buyer’s hands upon non-payment of tax by the seller. In case of default in payment of tax by the seller, recovery will be made from the seller. However, reversal of credit from the buyer will also be an option available with the revenue authorities to address exceptional situations such as missing dealer, closure of business of supplier or supplier not having adequate assets etc. Uploading of invoices by the seller who has defaulted in payment of tax above a threshold amount will be blocked to control misuse of ITC facility. Similar safeguards would be built with regard to newly registered dealers also. – In stage 1, while the new return software is developed, the present system of filing of return GSTR 3B and GSTR 1 will continue. Returns in form GSTR 2 and GSTR 3 shall continue to remain suspended. Stage 1 will continue for a period not exceeding six months. Content of the return and implementation: The press release mentions that the return will be simplified by reducing the content required to be filled in the return; the design of the return form, business process and legal changes would be worked out by the law committee based on these principles. Imposition of Sugar Cess and reduction of GST rate on Ethanol: The Council discussed the imposition of sugar cess and reduction in GST rate on ethanol and recommended to set up a Group of Ministers from State Governments to look into the proposal and make recommendations, within two weeks. Incentive to promote digital transactions: The Council discussed proposal of a 2% concession in GST rate on B2C supplies, if payment made through cheque or digital mode, subject to a ceiling of INR 100 per transaction, to incentivize digital payments. The Council recommended for setting up of a Group of Ministers from State Governments to look into the proposal and make recommendations. The GST Council also decided to acquire entire equity held by the Non-Governmental Institutions in GSTN, equally by the Centre and the States Governments. PwC Comments: The decisions on transitioning into a simplified return filing norm are aimed at making the compliance process less cumbersome for the businesses. The actual revised formats of the returns would be keenly awaited to assess whether this objective has been achieved. The decision to implement the return filing requirements in stages is welcome and will give time to both Government as well as the industry to transition into the revised compliance process. The decision to defer the imposition of sugar cess is welcome and the industry would hope that the proposal to levy an additional cess is not implemented, as it would undo the objective of ‘one tax’. The Government can exercise other measures at its disposal to meet the additional funding requirements for various objects, including increase in tax rates or compensation cess. The Authority for Advance Ruling (AAR) (Maharashtra State) has ruled that the accumulated credit of Krishi Kalyan Cess (KKC) shall not be admissible as input tax credit (ITC) under the GST regime. is binding only on the applicant and the officers having jurisdiction over the applicant, it is likely that the revenue authorities may take a similar view on the eligibility to carry forward credit of KKC on the basis of the observations and analysis discussed in this Advance Ruling. Since the ruling is based on the Delhi High Court order in the case of Cellular Operators Association, it may be followed by the AAR in other States as well. This position would also depend on the final outcome of the Delhi High Court order if appealed to the Supreme Court (It is not known whether appeal has been preferred against the Delhi High Court order). Further, the ruling has equated the levy of Swachh Bharat Cess (SBC) with levy of KKC. While SBC was not allowed as CENVAT Credit against the output service tax or SBC liability, KKC was allowed to be utilised to be paid against the liability of KKC. Therefore, SBC and KKC are not in equal footing from a CENVAT Credit perspective. This order may be challenged before the Appellate authorities and/ or the Courts, primarily on the grounds that (i) there is no specific restriction on the carry forward of credit of KKC under the GST law; (ii) KKC is subsumed into GST; (iii) the ruling has wrongly equated levy of SBC with KKC, which have different treatment for credit; (iv) FAQ’s do not have a legal backing; and (v) unutilized Credit should be allowed to be carried forward when there is such a paradigm change in the law or such credit, being an indefeasible right, should be refunded. In a recent decision, the Supreme Court (SC) held that the provision of section 40(a)(ia) of the Income-tax Act, 1961 (the Act) amended vide the Finance Act, 2010 should have been interpreted liberally and equitably and have retrospective application from the date of insertion of section 40(a)(ia) of the Act i.e., with effect from assessment year (AY) 2005–06.It may be noted that the said Section provides for the disallowance of expenses when tax has not been deducted or the deducted tax has not been deposited within the prescribed timelines. PwC Comments: This ruling clarifies that the amendment made by the Finance Act, 2010 though not given operation retrospectively, being a curative amendment should be given retrospective operation. This ruling reaffirms that the taxpayer should not suffer unintended consequences beyond what the object and purpose of the provision mandates. Issue considered in original assessment and no change in facts – Supreme Court upholds quashing of reassessment proceedings. In a recent decision, the Supreme Court (SC) dismissed Revenue’s appeal challenging the Delhi High Court (HC) decision, wherein it was held that the initiation of the reassessment proceedings under section 147 of the Income-tax Act, 1961 (the Act) on the taxpayer was nothing but change of opinion and was liable to be quashed. PwC Comments: This decision reaffirms the position that reassessment proceedings cannot be initiated merely on change of opinion, when the subject matter was considered during the course of original assessment proceedings. It further reaffirms that section 147 confers Tax Officer with the power to reassess the income that escaped assessment, but does not confer the power to review the original assessment proceedings. Supreme Court upholds deduction for lease equalization charges – takes note of ICAI’s Guidance Note on leases. In a recent decision, the Supreme Court of India (SC) has upheld the order of the Delhi High Court (HC) allowing bifurcation of lease rental income into capital recovery and finance income based on the Guidance Note issued by the Institute of Chartered Accountant of India (ICAI). Accordingly, the SC has also upheld the deduction claimed by the taxpayer for lease equalization charges debited to the Profit and Loss account (P&L a/c). PwC Comments: The SC has re-affirmed the principle that only real income in the nature of revenue receipts can be taxed under the Act. Importantly, the SC also has upheld the principle that a taxpayer can take recourse to the Accounting Standards/ Guidance Notes issued by the ICAI to compute taxable income under the Act, when not in conflict with any other provisions of the Act. Expenses excluded in computing “export turnover” have also to be excluded from “total turnover” in computing the deduction under section 10A. In a recent decision, the Supreme Court (SC) has held that expenses if any, excluded from “export turnover” have to be excluded from “total turnover,” while computing the deduction under section 10A of the Income-tax Act, 1961 (the Act) as export turnover (being the numerator) is a component of total turnover (being the denominator) in the formula provided for computing the deduction under section 10A of the Act. Further, the SC observed that the definition of “total turnover” given under the Explanation to sections 80HHC and 80HHE of the Act, is applicable only for the purpose of those sections and cannot be adopted for the purpose of section 10A of the Act. PwC Comments: This is a welcomed decision of the SC as it puts to rest a long-standing issue faced by various taxpayers claiming deduction under section 10A of the Act. In a recent ruling, the Bangalore Bench of the Income-tax Appellate Tribunal (Tribunal) held that the loss incurred by a taxpayer by selling goods to retailers at a price less than the cost price could not be construed as capital expenditure on building brand image or goodwill, as there was no accrual of liability or actual outflow in the form of payment. Further, it held that unless the revenue authorities rejected the books of accounts as provided under section 145(3) of the Income-tax Act, 1961 (the Act) they could not resort resort to a process of estimating the total income of the taxpayer on a notional/ hypothetical basis, except in certain situations where the Act specifically provides for taxing the income not earned by way of deeming fiction. PwC Comments: This is a welcome ruling by the Tribunal, as it clarifies that profit foregone by giving discount cannot be held to be expenditure on marketing intangible or for building brand or goodwill, as there is no outflow of funds or incurring of liability. This ruling also reaffirms that Revenue cannot invoke the provisions of section 145(3) without rejecting the books of account of the taxpayer. Tax officer is required to accept the prescribed method adopted by the taxpayer for determining FMV of shares. In a recent ruling, the Mumbai bench of the Income-tax Appellate Tribunal (Tribunal) held that the taxpayer had the option to choose any of the prescribed methods under the law to determine the fair market value (FMV) of unquoted shares and it was beyond the jurisdiction of the tax authority to insist on a particular method. PwC Comments: This is a welcome ruling by the Tribunal as it confirms that Rule 11UA(2) of the Rules read with section 56(2)(viib) of the Act provides an option to taxpayers for choosing one of the prescribed methods of valuation of shares. This ruling also confirms that it is also not open to the tax authorities to decide on these methods of valuation, without providing any cogent reasons for rejecting the method adopted by the taxpayers.